Looking to close out the Nationals today in the finale. And for those who missed it this morning, J.A. Adande is closing out his career at the L.A. Times. He has always been extremely professional in covering us and I’m sure that whatever he winds up doing, he’ll be successful. We certainly wish him luck. In regards to the question about going to the First-Year Player Draft in Florida, it’s not exactly open to the public but I’ve been told that they’ll try to accomodate people if they show up. So, while there aren’t tickets, you can try and go by the hotel and see if there’s a way to watch from inside. And finally, in case you didn’t see it in the comments section, here’s a very good article from Ken Rosenthal about Russell Martin. Enjoy the game and the usual debates…I’m on the East Coast this weekend starting tomorrow so posting might be a little slower. But, it seems Tony Jackson has been posting the lineups quickly, too, so check out his blog over the weekend if you don’t see a lineup here. It’s called, ironically, Inside the Dodgers. Good news out of San Bernardino. Just got a call from Mike Saeger, the 66ers broadcaster, who tells me Jason Schmidt went 6.0 innings and allowed two hits, one walk and struck out seven guys. He threw 71 pitches, 51 for strikes and topped out at 91 mph while averaging 88. Afterward, he said he felt great, so there should be a story with quotes from Jayson Addcox relatively soon on dodgers.com. Out in D.C., Joe and a bunch of the players and coaches went to Walter Reed Medical Center today, which is really a pretty cool thing. Despite the issues that the hospital has had over the past year, at the end of the day, the facility is still helping veterans recuperate and that means something. From what I’ve been told, the patients there were extremely grateful that guys like Juan Pierre, Andre Ethier, Chad Billingsley, Eddie Murray, Marlon Anderson, Dave Jauss, Jaime Jarrin, Rick Monday and others went down to see them when they didn’t have to. 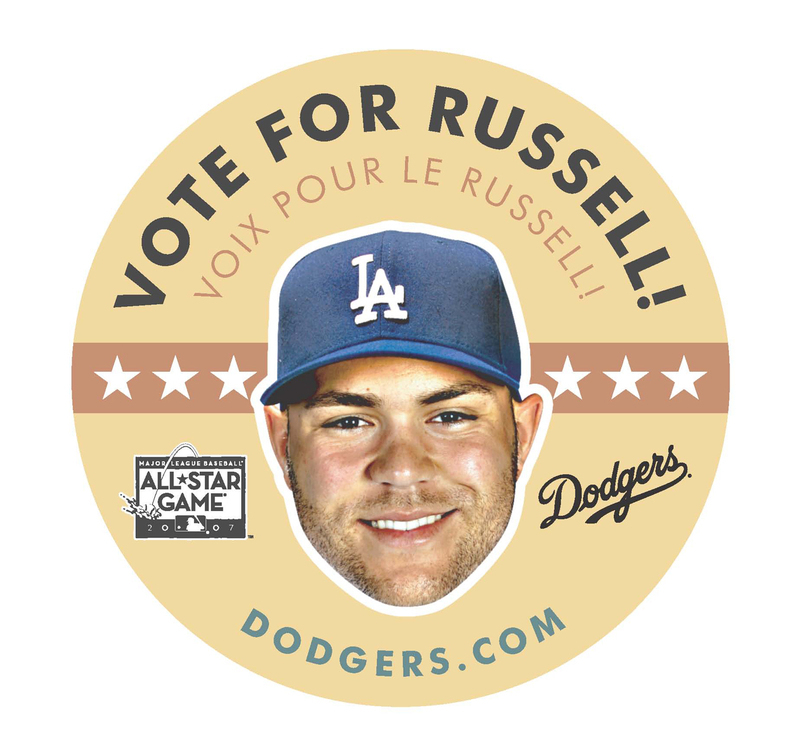 Also, I’ll probably throw a reminder in each day to vote for Russell Martin and the rest of the Dodgers. And as long as we’re talking about voting, Wes Parker stopped by this morning to tell me that all the work we’re doing on the all-time Rawlings Gold Glove team is paying off, as he’s apparently moved from third place to first place with just 20 days left in the voting. Please help keep him there by voting here. I know this would mean the world to him if he were to hold on and win. Glad to see everyone talking about Russell in the comments after Sunday’s game. He’s clearly becoming one of the best all-around players in the league, but you wouldn’t know it from the All-Star balloting results that came out today. He’s only ranked fourth among NL catchers, which is a joke I must say, with all due respect. The guy is leading NL catchers in just about every category that exists except votes for the ASG. I’m not sure if it’s because he’s young, plays on the West Coast or that other teams do a better job of getting out the vote, but it’s hard to even fathom him ranking fourth on a list of NL catchers. So, while I’m sure you’re tired of the constant campaigning, I have to implore everyone to vote for Russell up to 25 times with each email address. Campaigns like this have worked the last two years in bringing visibility to Cesar Izturis and Nomar Garciaparra, both of whom were deserving All-Stars and got to the Midsummer Classic because of you all. I know that it is ridiculous for us to have to solicit votes like this, but as long as the starters are determined in this manner, you’ll continue to see us trying to get out the vote. Anyway, getting off the soapbox for a moment, yesterday was a nice off day and I hope everyone had a nice Memorial Day and at least got a few moments to think about the significance of the holiday. 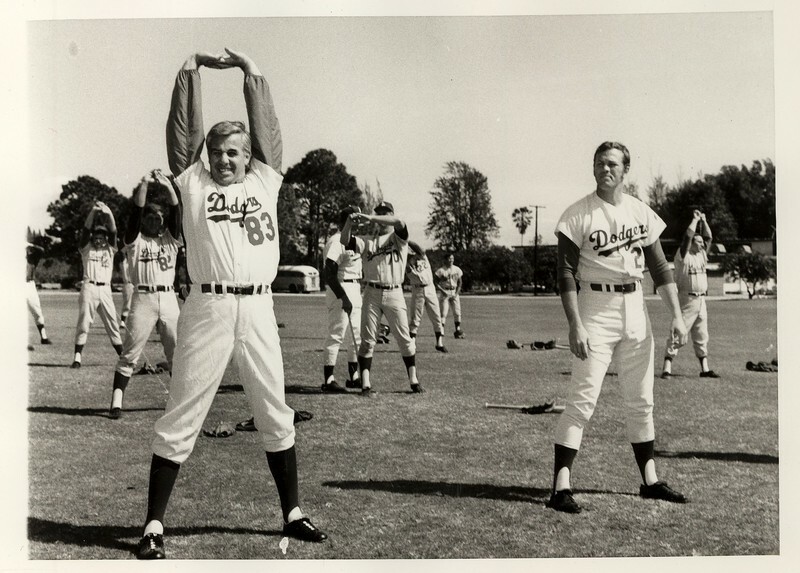 Fittingly, the Dodgers headed to the nation’s capital for the next three games and will be visiting Walter Reed Memorial Hospital tomorrow and the Pentagon on Thursday. I’m not on this trip, as I split them with our Assistant Director of PR, Joe Jareck. But he’s going to keep us in the loop with lineups and I’ll continue to blog from the West Coast. It’s time for the rest of the country to notice Russell Martin. If this guy isn’t the NL’s starting catcher in the All-Star Game, I’ll be stunned. He’s on national TV today and he’ll bat cleanup for the first time in his career (and will be wearing a mic, which is a great way to help raise his profile and show his personality). He leads all big league catchers with 32 RBI, 31 runs scored, 21 walks and eight stolen bases and leads all NL backstops in hits (51), average (.331), on-base percentage (.409). Don’t forget to do your part to get him there and vote for Russell. Today’s lineup, followed by some notes. ISLANDER INFIELD – Three quarters of the Dodger infield today hails from the Dominican Republic, as Wilson Betemit, Rafael Furcal and Tony Abreu each call the Caribbean island home. Abreu, who notched his first two big league hits last night, is a product of Campo Las Palmas, the Dodgers’ Dominican Baseball Academy. Former Dodger shortstop and current first base coach Mariano Duncan was also born in the D.R. For more information about Campo Las Palmas, see pg. 464 of the 2007 Information Guide. SLAMMING SAMMY – Takashi Saito has converted 39 of his first 41 career save chances, tying him with Eric Gagné for the best percentage (.951) in the Major Leagues in their first 41 opportunities since the save became an official statistic in 1969 (Source: STATS, LLC). Saito pitched a scoreless ninth last night to lower his ERA to 1.64, the fifth-best mark in the NL among pitchers with 20 or more innings pitched. Saito has converted his last 25 save opportunities dating back to 2006, the third-longest active streak in the Majors, behind Mike Gonzalez and Billy Wagner, who each have 29 straight saves. CHIP OFF THE OL’ BLOCK – Cubs’ special assistant coach Ivan DeJesus played for the Dodgers from 1974-76 and his son is now one of the top prospects in the Dodger organization. Ivan DeJesus Jr. entered the season rated as the sixth-best prospect and the best defensive infielder in the organization, according to Baseball America. DeJesus is currently playing for Single-A Inland Empire of the California League and went 4-for-5 last night. WHERE THERE’S A WILLS – On this date in 1971, Dodger great Maury Wills collected his 2,000th career hit with a single against the San Francisco Giants. Wills currently serves as a base running and bunting instructor for the Dodgers. (For what it’s worth, I’m currently reading Maury’s autobiography and it’s an absolutely fascinating book. I highly recommend it for anyone interested in the life story of a truly fine human being who has learned some of life’s most valuable lessons the hard way). GOING GONZO ON THE MICK – Luis Gonzalez collected his 2,415th career hit last night, tying him with Hall of Famer Mickey Mantle for 100th place on the all-time hit list. Gonzalez also has 553 career doubles and ranks 21st on the all-time list, seven behind Dodger Hitting Coach Eddie Murray. SAY CHEESE – Tomorrow is the annual Photo Day at Dodger Stadium, presented by Universal Studios Hollywood. Fans have the chance to come out and take pictures of their favorite Dodgers on the field from 11:15 – 12 p.m. Parking lots open at 10:40 a.m. and the center field gates open at 11:10 a.m.
Glad to see the comments get over 200, but I’m sure that has more to do with the fact that there was no post yesterday. That was with good reason, as I was lucky enough to go out to the Dodgers Dream Foundation Golf Tournament at Trump National, where several players, coaches, broadcaster and former Dodgers hit the links for a good cause. It’s always nice to get out of the office for the day, but it’s even better at Trump National, where every hole is right on the ocean. It seemed like everyone had a great day and our community affairs department, particularly David Brennan, deserve a huge congrats on a job well done. As for the headline of this post, it’s a reference to Stu Nahan (at left in this photo), who is getting a star on the Hollywood Walk of Fame today. Stu has been a mainstay in Los Angeles for decades and as recently as a couple years ago, was a regular part of the KFWB pregame show. He’s an incredibly nice gentleman and always keeps things light and humorous, even through his recent bout with cancer. I’m honored to consider him a friend and the entire Dodger organization wants to wish him congrats on his latest honor. Also, in case you missed it, here’s a link to one of Steve Henson’s final articles for the L.A. Times. Steve is moving on to Yahoo Sports and will certainly be missed on the beat. He did an extremely fair job in covering the team over the past three seasons and I’m guessing you all, as his readers, enjoyed his work. No word yet who will be replacing him in the short-term or long term, but we look forward to seeing his articles on Yahoo.com. In this article, Steve wrote all about the Carne Asada Sundays with Nomar, which was actually Nomar’s idea! The event is June 10 and tickets to the event can be purchased on the Reserved Level at tonight’s game or Sunday’s game or by calling 323.224.1435. Spots are extremely limited so if you’re interested, I’d get on it now. And for what it’s worth, here’s an update on the parking situation from yesterday’s L.A. Times. We have recalled Yhency Brazoban from Las Vegas and put Chin-hui Tsao on the disabled list with a right shoulder strain. Hopefully we’ll have more information from Grady once he talks to the media but I wanted to at least let the masses know first. Also, I just came from a lunch in the dugout club with Grady and Ned that was held for the people who have the baseline box seats and it was a really nice Q&A format. A lot of questions got asked from fans just like you to both the GM and manager and they did a very good job answering as candidly as they could. There was one question about our move to SF that Grady and Ned weren’t sure of the answer, so on the off chance that this gets back to the guy who asked it, here’s the scoop. The question was if the rumor is true that when the Dodgers and Giants moved West in 1958, the two teams went into a room and flipped a coin to see who would go to SF and who would come to LA. Grady deferred to me and I told them that I had never heard that before but I wanted to be sure. I’ve now confirmed with team historian Mark Langill that there is no truth to it. So, for what it’s worth, you can pass that around to anyone who asks. And, before I forget, here’s great news for those of you not in LA (or even those who are). You can now buy a 2007 subscription to Dodgers Magazine. Go to dodgers.com/magazine and you’ll get all seven issues of the 2007 Dodgers Magazine, the 2007 Dodgers Yearbook (featuring Vin Scully and Jaime Jarrín on the cover) and two vouchers for $5 off Reserve Level tickets for your next trip to Dodger Stadium. It’s a $60 value for $34.95.